We’ve had some requests for an archiving solution so it seems a fitting time to republish this blog post. Also check out Episode 48 of The Two Hosers Photo Show for more on this subject. The scenario is a familiar one. Ever since you went digital you started firehosing with your camera. Why take one when 10 cost the same price? And you can always delete them later. But you don’t. Even if you did delete the ones you couldn’t use you still wind up with a whole lot of pictures to deal with. How do you manage the bloat? I know some people who simply buy more and more external hard drives and promptly fill them up. I even know one guy who bought a new laptop because his current one was disorganized and full. There are many ways to deal with this but I will outline my method. First I need to clarify that I shoot RAW files exclusively now but that wasn’t always the way. Therefore I will address how I deal with all my old JPEG files and then talk about my RAW workflow later. So here’s the JPEG routine. I’m a Mac guy. Have been for a while. I’m not trying to sell you one but keep this in mind when I outline the procedures. If you are a PC user then you will have to do the necessary translation on your own. Alternatively you could just climb under your covers and weep. When I shoot/shot JPEG it was always at full resolution. Whatever the camera could handle I used and created the largest files possible. I take the CF/SD card out of the camera and pop it into a card reader which shows up on the desktop as a drive. I find the photo files on that drive and copy them to my hard drive. Yes, you can import via iPhoto but that isn’t my move. I want to have the untouched files archived before I do anything. Once they are on the computer my first task is to rename them. 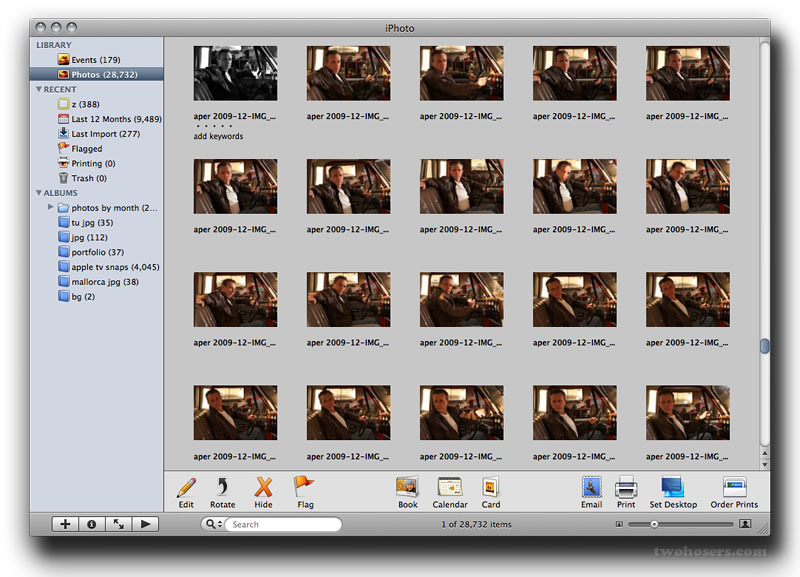 If you take a lot of pictures you will eventually go over the 10 000 mark and start again, creating a duplicate file name. Or perhaps you will buy a new camera or reset yours. Maybe you receive photos from a friend who has a similar camera. Whatever happens I like to avoid duplicate file names. Now that the files are renamed but the photos themselves are unharmed I drag them to an external hard drive solely for backup purposes. Keep in mind that I did all of this BEFORE I deleted the camera’s memory card. If something goes wrong in this process it is nice to have the originals on hand. At this point the pictures exist in 3 locations- the camera, the laptop, and the external drive. We are actually going to burn them to a disc as well but not yet. At this point I go back to Automator and use a different workflow that shrinks the pictures down from 12 MP (or whatever you are shooting) to a much more manageable 0.3 MP. During this process I have Automator add a letter to end of the file to denote that this is a “small” or “preview” copy. “2009-11-9999″ becomes ”2009-11-9999-s”. Almost identical. Next I import into iPhoto. I like to create a new album for every month to make my life easy. In order to have the albums make sense I label them after the file naming convention. 2009-11 for example. Now you will have all of your pictures in one central library with easy access. The 600 pixel files are still suitable for e-mail and what not but if you need access to the full-res files for printing you will be able to find them instantly on your external drive. Remember, in order to make the back up process as bullet-proof as possible you will want to burn the full res files to disc or another external drive and store them off site somewhere. There are also online options for this too. The other thing to keep in mind is that this requires a certain vigilance and while daunting at first becomes so simple that maintaining it is not an issue. The results are worth the effort.